One of these times a seemingly weak anime season will actually be as bad as it looked going in. I thought the streak might end with the Summer 2017 season; however, once again, I missed several quality series in my initial estimation and this season turned out to be a pretty decent one. It was far from being one of the best but it also was far from being the worst. Of the fifteen series that I watched this season, six were good enough to warrant inclusion on a best of season list. How did your favorites fair? Read on to find out. Nana Maru San Batsu was one of the pleasant surprises of the Summer season. I almost didn’t give this show a chance because it fell within the crowded genre of high school club doing their sport/activitiy and nothing initially called out to me that this could be something worth watching. I’d mistaken the show’s low-key approach for being generic. 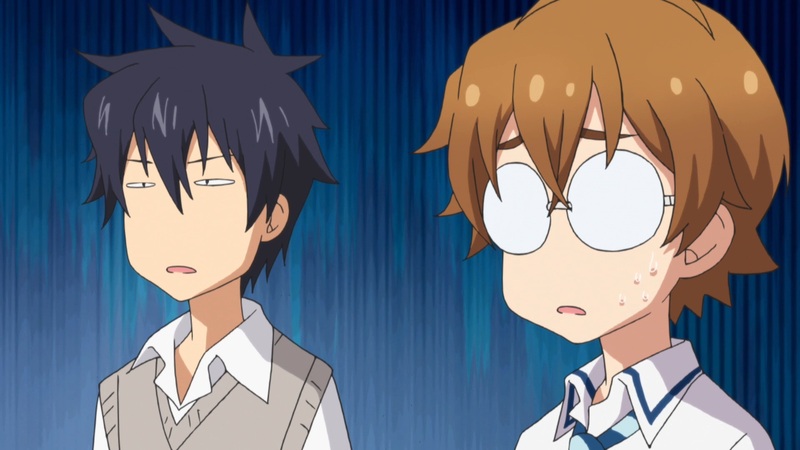 What wasn’t apparent from the trailers and probably the show’s greatest strength is that Nana Maru San Batsu eschewed the easily recognizable character types that trade interest and depth for repeated familiarity and then it allowed these characters to drive the story. For example, the one supporting character is really into playing video games but he was never shown to be a “gamer”; nor does the main female character ever come off as a “nerd” even when she really likes quiz bowl, which just screams being a nerd. Both of them are shown to be people, not stereotypes. The down side in creating interesting characters with depth is, when the series is only 12 episodes long, it’s annoying to be teased with all this character potential and having nowhere near the time to explore it all. And that explains why this series only ranks at number 6; it’s well worth watching but it’s not reached it’s full potential yet. A sequel would be very nice. Made in Abyss is another series I almost skipped. I have an (ir? )rational fear of anime adaptations of video games and, in my very brief scouting of the upcoming summer series I did back in June, I somehow became convinced this was related to the Tales of the Abyss videogame or prior anime adaptation. 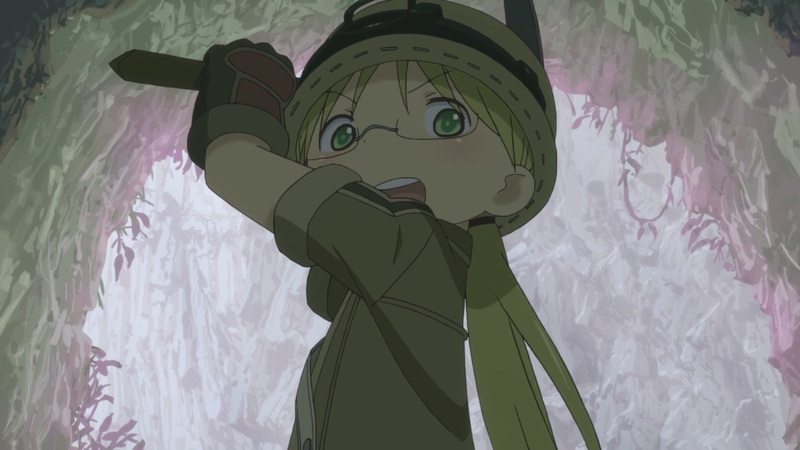 For the record, Made in Abyss is not related to a prior video game, but, it could be turned into a really cool video game. What I knew going into this series was it supposedly featured bad stuff happening to cute kids in an interesting fantasy world setting and that turned out to be an apt description of about 75% of this series so far. To be honest, while this piqued my initial interest, my fascination with Made in Abyss slowly sagged more and more as the repeated sameness of watching bad stuff happening to the two main characters (who aren’t all that interesting themselves) became tiresome. I was about ready to completely write the show as merely decent with a really good soundtrack when the third main character, Nanachi, was finally introduced in episode 10. This was the game-changing moment of the series. Each of the last three episodes were progressively better than the previous one with the final double length episode being the best overall episode of the season. With plenty of the Abyss still to explore and the addition of a new main character, a sequel would very much be appreciated. There is something rather positive to be said for adapting a long running shounen series in discrete chunks like Bones is doing with My Hero Academia. It should ease the logistical problems of producing the same anime for months and months without break. It also forces the viewer to wait a bit in anticipation and that helps to reinforce interest in the series as the viewer spends the time in-between remembering what’s already happened, what they wish will happen, and figuring out what will probably happen. On the other hand, as a very interested viewer, I’d much rather if Academia had continued into this Fall season. Instead, the ending for this second season wasn’t really an ending, more like a pausing, which makes it difficult to give this season of Academia the perfect score the entire series will probably collectively earn in the future. And I find that a shame because I love how this series has built upon the potential shown in the first season. Deku continues to master his powers in superhero high school and we’re beginning to see flashes of the hero that will be a worthy successor to All Might. 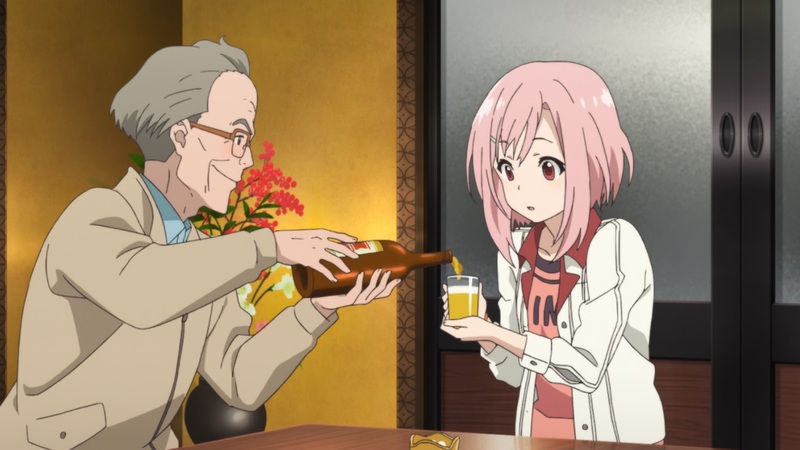 The supporting cast are all getting solid character development and the variety of their problems and desires really keep the story interesting. 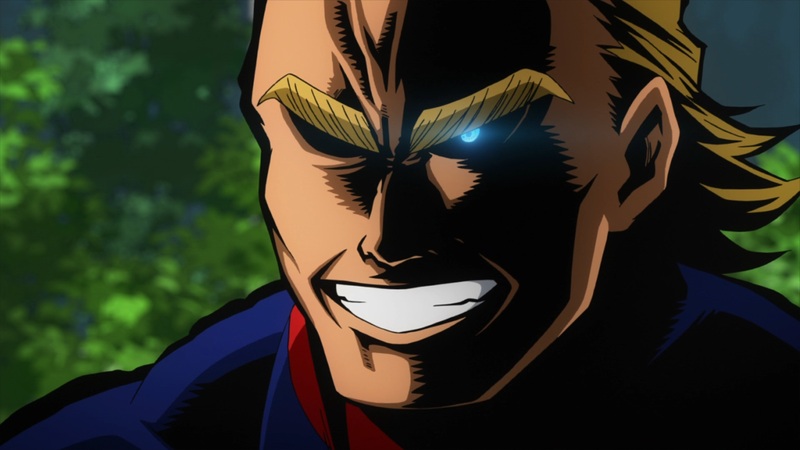 The nemesis of All Might isn’t as dead as everyone thought and he’s beginning to maneuver the villains into a combined force to counter the heroes efforts in ensuring the safety of society. It was all very interesting and the announced third season should continue the upwards trend of the show as we get to see more of the story and watch the characters continue to develop. It can’t come soon enough. 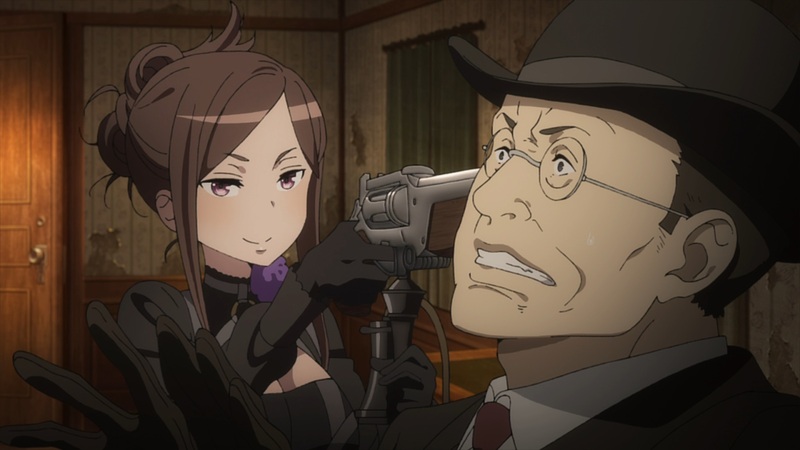 With a high octane concoction of alternative history, steampunk, politics, and spycraft; Princess Principal took a premise too goofy to actually work and made it work by knowing when to allow the show to let loose and go silly/crazy – as long as it looked cool – and when to focus on the meticulously planned story that focused on it’s characters, their problems, and desires. It was quite the tightrope this series walked on but it never faulted or lost it’s way. There were so many ways Princess Principal delighted me, as the number of awards I gave it in the first part of my best of Summer anime season report can attest to. One thing I don’t think I mentioned was how I enjoyed spotting the various references the show made during it’s run. To name a few, the C-ball which allowed Ange to float was named after a similar device created by a Mr. Cavor in the H.G. Wells story The First Men in the Moon, Poison Gas Jack was a takeoff of the Victorian England urban legend Spring-heeled Jack, and the spy school Dorothy and Ange attended was called “The Farm” which is what the CIA’s spy school at Camp Peary is called. The politics driving the story and the Princess’s desire to reunify England helped make the story interesting and the desire to see how it will be resolved makes this another series I really hope gets a sequel. I think there might be a good chance of this happening because it was incredibly obvious the creators had a ton of fun making Princess Principal and they probably want to do more. Owarimonogatari 2 had much to prove as a series that capped a franchise that began airing in 2009 and has seen many series and movies since then. I wasn’t sure a sprawling franchise like the Monogatari series could even be given a proper “ending”. Over the length of seven episodes, Owarimonogatari 2 shattered that doubt as the seemingly inexhaustible imagination behind this franchise was able to surprise and delight as it went well beyond a proper ending by giving the viewer a thrilling and completely satisfying conclusion to the story that began back in Bakemonogatari. 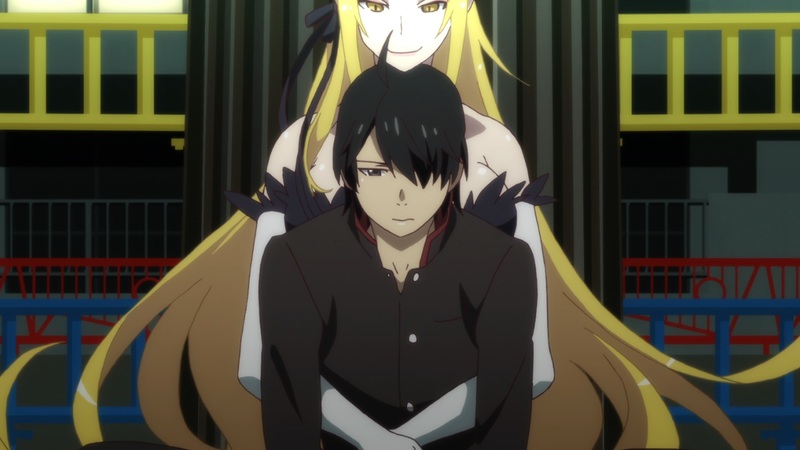 Without spoiling the story too much Araragi goes to hell, then on a date, meets a god, confronts his inner demons in a literal sense, graduates high school, and finds that he’s matured greatly since we first saw him all those years ago. This franchise has always been known for it’s extensive and imaginative fan service, but, while I can’t deny this fan service is an essential part of it’s show, I think it’s the story that’s the truly fascinating aspect to the franchise and the reason it should be watched. The focus of Owarimonogatari 2 on being a real conclusion to the franchise feels almost like a vindication of this belief. (Assuming I was the type of person who gets into arguments about actually being here for the plot with people online.) Between the success of this series and the prequel movies being spectacular in their own way, I will almost assuredly be putting the Monogatari franchise somewhere in the top 10 when I redo my top anime of all-time list. Agree? Disagree? Wondering where I placed the other nine series I watched this season? I’m always interested to read what others think; I might just forget to leave a comment until the third or fourth time I’ve read your comment. Nice to see Fastest Finger First getting some love. It wasn’t a fantastic show but it was really fun and much better than I initially expected from the premise. @Karandi: Sorry for the really, really slow response. Yes, Fastest Finger First was an easy one to overlook. It’s a shame that the single cour for this show was really just a tease for the show’s potential. Maybe it’ll get another season or two.